Everyday, you have shown how kind and pure your heart is. How beautiful and lively your soul is. I see the beauty of the world through your eyes and in your presence I find all the courage to take on the fear I use to have within. If someone says you are beautiful, it could be because of your face or your heart, if its related to the former, I wouldn't give it two thoughts, but if it's for the latter I'm sure they mean it. 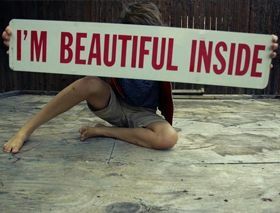 Real beauty lies inside the heart and thoughts of a person not on his/her outer appearance. The beauty of a woman must be seen in her eyes not in her physical appearance. Eyes are the doorway to her heart, the place where love truly resides. Focus on the inward of your beauty. The sign of a beautiful person is that they always see the beauty in others. A woman is beautiful when her passions define her more than her looks. Being passionate about something is the most beautiful characteristic you can develop. The beauty of everything is beyond just the mere surface that we observe it from, it lies way beyond our view but within our grasp. We have often heard the maxim that beauty is only skin deep. This maxim emphasizes inner beauty, i.e. beauty of the heart because outward beauty or what we call physical beauty is ephemeral. It does not last all your life. You are bound to get aged, have those wrinkles on your face, put on weight with time and so on and so forth. Though there is always an option to stay fit but sooner or later, the teenage charm will fade away. What keeps people tied to you when you are no longer that attractive or in your prime? It is your inner beauty. If a person is good at heart and is well-natured and civilized, he will be respected by all and sundry. Inner beauty comes from a mind and heart that is completely devoid of any ill feelings such as jealousy, malice, anger and the likes. A person who is beautiful on the inside has a very clear and clean mind.